The goal of the Sustainable Sullivan Project is to reduce the carbon footprint of our county and stimulate job creation in energy efficiency and renewable energy. A series of easy to use tools has been developed that are now available to use in municipal, commercial, civic and residential projects for energy savings and operational cost reductions. SASD will train volunteers in using calculators and other tools to assess opportunities for solar electric, solar thermal, geo thermal, wind, energy efficiency, and transportation savings as well as provide technical support in every aspect of funding. Call Carol Roig, Sustainable Sullivan Program Director at 807-0578 to discuss and schedule project development and training sessions. SASD is also interested in hearing from citizens and businesses who have initiated energy efficiency and renewable energy projects. This information is very important for the county-wide plan for climate change action and sustainable economic development. A statewide program to promote energy efficiency and the installation of clean technologies to reduce energy costs and reduce greenhouse gas emissions. The program will support sustainable community development and create opportunities for green jobs. This program will be administered by NYSERDA. Free or low-cost energy audits through NYSERDA’s Home Performance with ENERGY STAR Program are available to residential customers. 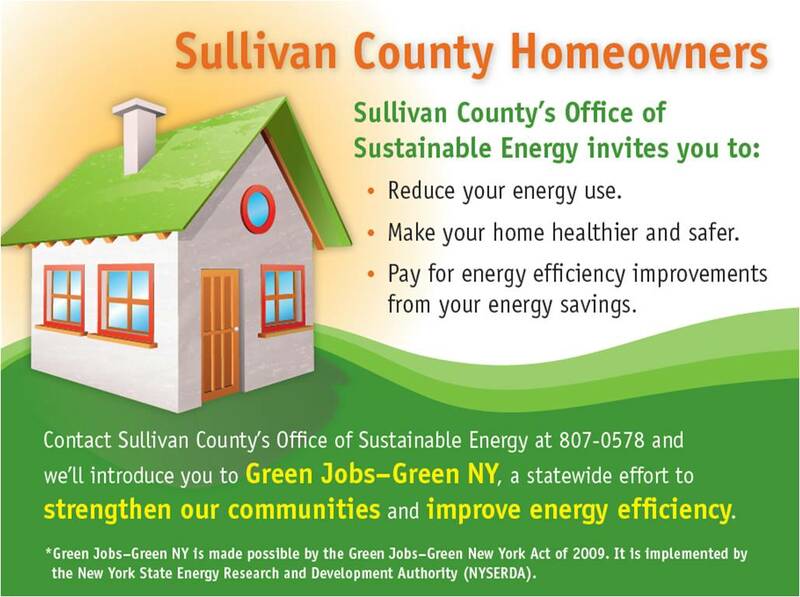 Participants in the Home Performance with ENERGY STAR Program can implement cost-effective measures using Green Jobs Green NY – Financing which offers residential loans of up to $25,000. Learn more about low interest rates and how to apply atEnergy Finance Solutions . The maximum loan is $25,000. Terms of up to 15 years are available. Information from NYSERDA’s Green Jobs/Green New York page.